Dessert is the best course of any and every meal. When the craving for one hits, you have to acquiesce to it. We’ve got the 10 of the sweetest spots in Durham right here for ya! They started as a tricycle donut stand and look where they are now! ? The first time I had Monuts was at their location off Parrish Street and the line was always out the door. We came back weekly to try every variety of donut they had. ? Then we tried the bagels and said ‘we’ve been missing this the whole time?!’ ? It’s amazing to see how they have grown and they have even more deliciousness and variety now. They have a rotating selection of unique donuts and some classics like apple cider!You get a free donut or pastry with the purchase of any espresso drink with your Shop Durham card. Small batch, California- style, made-from-scratch donuts. The donuts come in a variety of flavors, including glazed, chocolate glazed, peanut butter cup, Oreo and many more. You can even personalize your donuts with the fillings! Vanilla and chocolate, along with lemon, cherry and raspberry can be hand-pumped into each donut at the time it’s ordered. Grab some local Joe Van Gogh coffee as well! Early Bird Donuts is open Tuesday through Saturday from 6 a.m. to 2 p.m. and on Sunday from 7 a.m. to noon. Foster’s is a Durham staple that is known for their scratch-made soups, salads, sandwiches, and casseroles. But my absolute favorite is their desserts! A piece of pie with some coffee is the perfect treat. They have at least a dozen pies, cakes, or baked goods variety on any given day. Wonderful handmade pies, specialty coffee drinks, and even some wine for date nights! ? This concept is all the way from Los Angeles and it pairs perfectly with our foodie town. Treat yo’ self to some pie! Get 10% off your purchase with your Shop Durham card. You may not be able to say the name correctly or even remember how to spell it when you’re telling your friends to meet you there, but Guglhupf is pure magic. A German-style bakery serving up breads, pastries, and desserts, they’re an award-winning local favorite. Now this is what Durham is all about. This is Morros de Toros, made from scratch churros topped with The Parlour ice cream finished off with chocolate drizzle! You can only find this amazing creation at Cocoa Cinnamon, the Chapel Hill Rd location. Cocoa Cinnamon has 3 Bull City locations and each has their own unique character. The Lakewood location (pictured above) has fresh churros and they even have a roastery here! Cocoa Cinnamon has their own coffee brand, 4th Dimension, that is served at all locations and is available for purchase. Buy a bag of 4th Dimension Coffee and get a free prepared drink from the menu with your Shop Durham card. An experience you won’t find at any other restaurant in Durham – unique, nostalgic and fun! For dessert, don’t pass up strawberries dipped in milk chocolate or bananas with a dark chocolate and peanut butter blend. Use your Shop Durham card and get free dessert with the purchase of an entree. Small-batch, hand-crafted ice cream. We’re drooling just thinking about it! They have unique flavors that rotate to match the season, and they even have some vegan options. And not just any old vegan options, we’re talking award-winning vegan ice cream here. Salted butter caramel is a personal favorite! At Pine Cone, they serve the essentials: Maple View Farm ice cream and Joe Van Gogh coffee. That being the case, sometimes I’m here twice a day! AND you get 10% off with your Shop Durham card! 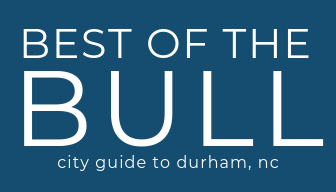 At Best of the Bull we focus on the homegrown, locally owned businesses that make Durham unique. It’s tough to pack all that local goodness into one article! If we left something off that you think we HAVE to try, just let us know! We’ll respond and, heck, probably invite you to come along. Thanks for reading!